Stalwart Investment Advisors | Why we bought Amrutanjan Healthcare and continue to like it! ‘While, I was reading about this company I literally fell asleep’ said a smart analyst during one of our Chai pe Charcha meetings sometime in mid 2014. ‘You know.. it’s a 120-year old company and still does only about 140 Crores in sales, and by the way who really uses balm these days? I guess it’s a dying business’ he continued. That’s what really got us interested to study it more as we had some idea already that it’s an owner-operated FMCG business with a net cash balance sheet, and zero institutional ownership- seemed like a classic Peter Lynch type boring story which nobody wants to even talk about. The only missing part was growth potential and over next few weeks that one question kept us busy. Amrutanjan until 2012 was mainly selling balms, a Rs 700 Cr. category growing in high single digits, led by Emami’s Zandu with a 55% market share followed by Amrutanjan with about 10% and rest of the market catered by 800+ SMEs. In this avatar, it was indeed difficult to imagine Amrutanjan’s topline clocking 15-20% CAGR. The interesting observation though was their recent foray into body pain management category which was not only worth Rs 1,300 Cr. but rapidly growing. This category is still dominated by handful of players like Ranbaxy’s Volini, Moov, Iodex and Relispray. They also ventured into congestion management, a Rs 200 Cr. category wherein Vicks enjoys monopoly. Since these products were actually similar to balm but just different in form, application and packaging; probability of Amrutanjan making a dent here seemed reasonably high. Branding: Until 2013 they were spending 8% of sales on Ad and promotion, however based on our management interaction we understood they were planning to increase it by 50% i.e. 12% of the sales for FY15. We were very impressed with the thought process and though it would hurt near term earnings, but we appreciate the fact that management started making meaningful efforts to regain lost ground, improve brand recall and longevity of the business. 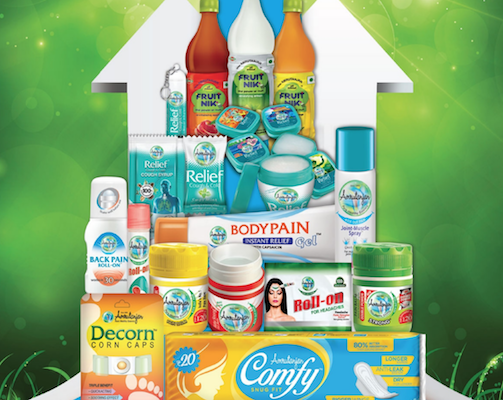 Amrutanjan was ranked 5th most trusted brand in India under OTC Category in the study conducted by Economic Times 2014. Distribution: Unlike Zandu which has a pan India presence, Amrutanjan was largely concentrated in South India which contributed ~65% to the revenues, East did 18%, West 17% and North merely 2%. In Tami Nadu they have a whopping 50% market share. The way we looked at this was as follows- Being 120+ years old brand, Amrutanjan does enjoy decent recall which will only improve with higher ASP investment. The fact that they have covered not even half of the potential distribution is actually a significant opportunity that is yet to be tapped. Leadership: Amrutanjan is currently led by Sambhu Prasad, grandson of the founder Nageshwara Rao. As we studied older annual reports, we saw a transition in the way annual reports were drafted and the factors that were stressed upon – Share of Voice, Focus on ASP, Distribution expansion strategies, New Categories, New Geographies, RoCE etc. The quality of information via annual reports and quarterly results has also been continuously increasing. 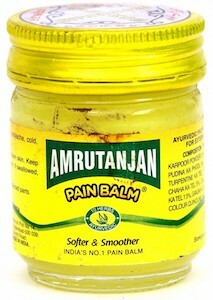 Renewed Focus & innovation: Amrutanjan was the first such balm and its founder Nageshwara Rao had even got it patented. However over time they seem to have lost focus and next generation failed to effectively leverage this first mover advantage. That focus seems to be coming back with product extensions; launch of innovative back pain ‘Roll-on’ format which became a run away success and later imitated by competitors, is a testimony to that. Similarly Amruntanjan was the first company to launch Rs 2 sachet which was later launched by Zandu. Recently, it increased the efficacy of its product by increasing menthol content and also launched a new cardboard packaging, moves which were later replicated by Zandu. The fact that these moves are being followed by all competitors (big and small) reinforces the opinion that it is getting its mojo back. Beverages: Fruitnik Brand, which clocked Rs 22 Cr. in sales in FY16 is currently sold in Tamil Nadu and some eastern states. Non-carbonated beverages category is today worth Rs 8,000 Cr growing at 30% CAGR. Amrutanjan aspires to scale Fruitnik to Rs 100 Cr. brand in a few years. Female Hygiene: They are also present in Female Hygiene category through Comfy brand of sanitary pads, which is positioned as an affordable brand targeted towards users from semi-urban and rural India. The category is worth Rs 1,800 Cr. and is a duopoly of StayFree and Whisper. As per study by Deloitte India, 70 per cent of Indian women cannot afford to buy sanitary napkins and more than 20 per cent of adolescent girls drop out of school because of menstrual issues. Only 12 per cent out of 355 million women in the menstrual period use sanitary napkins, while remaining 88 per cent would choose rags as substitute. In most cases, we don’t get excited looking at non-operating assets like land, however in this case it did add some comfort in our valuation analysis. Amrutanjan has 2.5 acre land at Mylopore, heart of Chennai which had its manufacturing facility as well as the corporate office. In 2014 they bought a 5 acre land in outskirts of Chennai and decided to move the manufacturing. That got us excited that there could be plans of monetizing this land, though not part of core thesis it did give us an additional margin of safety. We also had some history to judge how this money could be deployed. Amrutanjan had sold a land parcel in 2009 for ~Rs 84 Cr., out of which 17 Cr. was distributed as special dividend, Rs 6 Cr. was utilised for Buy-backs, Rs 26 Cr. for acquiring Fruitnik brand and rest were preserved as cash. During FY11-FY14, it had an average dividend payout of of ~35%. For a 140 cr. sales company, this kind of capital allocation track record was very impressive. We entered at an enterprise value of Rs 370 Cr., i.e. 2.5 times its trailing sales. This seemed attractive given Emami had paid five times sales for Zandu, which had a stretched balance sheet. This was without taking into account the land value. In terms of P/e it was available at 25 times, not cheap if all it could grow was in single digit but cheap even if any one of those new initiatives took off. Other considerations being- the capital allocation track record, 60%+ Gross Margin Profile, 50%+ RoCE of base business, current earnings being depressed due to losses of Fruitnik, Chemical Subsidiary and Pain Management Centers business in Chennai. The company is generating substantial free cash as new plant has enough capacity to support growth for next 3-4 years. Who uses balm anymore? What about Growth? – This is true that modern medicine has made huge progress, but allopathic medicines do bring lot of unwarranted side-effects too. Chronic headache and body pains are lifestyle diseases which only seem to be on the rise. Amidst this, balms offer ayurvedic and herbal remedy through external application with no side effects. As a matter of fact, it is finding takers that is why the category is still growing, albeit in low single digits, instead of contracting or stagnating. For Amrutanjan, the balm business is a cash cow which is facilitating scale up of fast growing categories like Body Pain & Fruitnik as well as seeding new categories like sanitary pads. Further, we feel there is enough scope for distribution led growth to non-south markets. Other verticals are bleeding; good money after bad? Chemical subsidiary was shut down in FY16. The pain management centres are also expected to be shut down soon. Fruitnik, which was facing difficulties in supply chain until FY16, is now scaling up well and is expected to turn profitable in FY18. Promoter is based out of US; Is business getting enough attention? – Its true that Prasad’s family is still based in the US and he seems to be juggling to manage both professional as well as personal life. However, there is no apparent reason to believe this is causing any harm to the business operations, however in absence of a professional leadership there is still a possibility of this posing a challenge in scaling up the operations to next level. Our interaction with him makes us believe he has fire-in-the-belly traits and has ambitious plans to take Amrutanjan Healthcare to next level; the promoter family has no other business interest outside Amrutanjan and has more than 95% of their net worth in the listed entity. We understand he is open to rope in a professional CEO few years down the line. There is a huge scope for exports too; currently exports constitute merely 1% of revenues and are mainly to Middle East and Uganda. Amrutanjan has applied for US Registration and is expecting to get its facility inspected, post which exports to US will commence. Disclaimer: This is not a recommendation to Buy. We and our clients hold shares of Amrutanjan Healthcare. Read complete disclaimer here. Now after the fall, would you still have a good long term view on this company? Second, now a days people prefer to use pain sprays. Third, do you think Vijay Kedia investment will also be fruitful in coming years? Very Nice post on ‘Amrutanjan’ sir. thanks for excellent piece of work!! this will of course help tons of investors. Please keep it on. A very good analysis of a hidden gem. The quality of analysis is indeed one of the best i have come across. This stock will now be on my Watchlist.